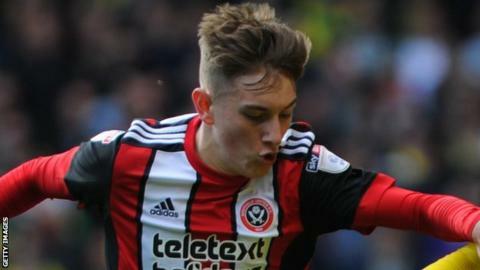 Sheffield United's highly-rated midfielder David Brooks has signed a new four-year contract at Bramall Lane. The 20-year-old has been linked with a move to the Premier League after impressing this season. He earned a call-up to the Wales senior squad for the recent World Cup qualifiers against the Republic of Ireland and Georgia. Brooks is also eligible for England and scored in the final of the prestigious Toulon youth tournament in the summer. He made his first league start for the Blades against Norwich last month and has played 10 times in the Championship this season. "I'm delighted that David has yet again extended his contract - he's been rewarded for an excellent start to the season," manager Chris Wilder told the club website. "David sees his future at Sheffield United and that's what we want to hear because, without doubt, he is one of the hottest properties outside the top flight."